NetEnt is one of the biggest names in the field of iGaming. This company has created some of the most popular online slots. 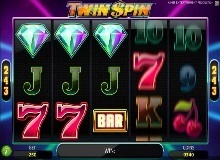 One of their more popular games is Twin Spin Slot. This title has no pay lines – but it features 243 ways in which you can win. The theme of the game isn’t really unique or discernible. The closes we can come to explaining it is that it will make you feel like you’re in a real casino. It has catchy, unobtrusive background music that enhances the atmosphere. Below you can learn more about the main features of the slot. You can easily find an online casino where you can play Twin Spin for real money. As we’ve mentioned before – this is a very popular slot. The first thing that will catch your eye about this title is its simplicity. You can pick it up and play it in a matter of seconds. All you need to do is select your bet size, and you’re good to go. The lowest bet you can place at this slot is 25 coins. All of these symbols have their own distinctive values. The Wild symbol is not really designed in a unique way. It’s just the word “WILD” written in italics and with a flashy font. It can take the form of any other symbol. 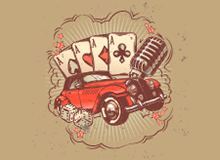 The most unique feature about the Twin Spin casino slot online is the namesake “Twin Spin” feature. In every single turn of the wheel in the game, there will be at least two adjacent reels that will be “twins”. This means that they will have the exact same symbols at the end of the turn. If you’re lucky, you can get all 5 of the reels to become twins – for huge wins. The Twin Spin game is of low volatility. It has an RTP rate of 96.6%. This means that the casino has an edge of only 3.4%. This is the perfect slot to play if you’re risk-averse. Other than that, you should be mindful of the size of your bets – as they can vary significantly. There is no way in which you can use cheats and foresee what the game will play out. In this sense, this is a game of chance. Sometimes you will win – and sometimes you will lose. Be careful about long-term betting – as the casino maintains its edge over the player in the long term. You’re all but guaranteed to lose money if you bet long-term. The highest amount of money you can in this game is 270,000 coins. This translate to a lot of real money. However, it’s not a frequent event that someone wins this sum of coins while playing. 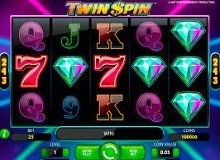 In all cases, we suggest you find a Twin Spin free version online before playing with real money. Luckily, you can easily play Twin Spin slot machine online and for free. There are many online websites that feature a demo of this game. Once you get acquainted with how the game works – then you can make a deposit at one of the online casinos that feature it. Then you can play it for real. 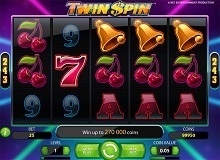 Twin Spin Slot features some nice graphics and animations. However, overall, it’s a pretty simple game. The only two special features in the game are the wild symbol and the twin reels. If you’re lucky enough to combine these two features – then you can win a lot of money. Aside from that, the low volatility and the 96.6% RTP rate are perfect if you don’t want to take any big risks. This means that you won’t be able to make huge profits as easily – but it also means that you won’t be able to lose your money as easy, either. Have fun with Twin Spin by NetEnt!